Cardiovascular disease is the number one cause of death in the United States. Most Americans are unaware they have it until they suffer a catastrophic health event such as a heart attack or stroke. Early detection of CVD through preventive screenings is the best way to protect your health and wellbeing. Radiology of Greater New Haven is dedicated to providing the highest quality screenings for cardiovascular disease at affordable rates. We offer a variety of elective screenings in our office for conditions such as coronary artery disease, artrial fibrillation, peripheral arterial disease (PAD) and abdominal aortic aneurysm (AAA). Patients with health insurance must obtain a referral from their physician to schedule any of our preventive screenings. Appointments for preventive screenings for uninsured patients at Radiology of Greater New Haven are available with or without a referral. Carotid artery screening can detect harmful plaque on your arteries before you’re at serious risk of a heart attack or stroke. The procedure is simple, painless and non-invasive. Anyone over age 50, or over age 40 with risk factors for stroke, carotid artery disease, or atrial fibrillation (irregular heartbeat) should talk to their doctor about this screening. Our sonographer will ask you to lie on your back and a gel will be applied to your neck. 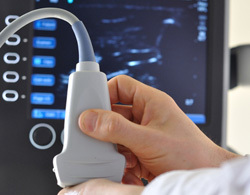 An instrument called a transducer will be moved across your neck, creating images of the carotid arteries that will allow the rate of blood flow within them to be assessed. Artrial fibrillation is the most common type of heart arrhythmia, or irregular heartbeat. This type of heart beat can cause a clot which may travel to the brain, resulting in stroke from the disruption of normal blood flow. Anybody who has risk factors for stroke, atrial fibrillation, or carotid artery disease should talk to their physician about this screening. The screening is painless and simple, using EKG electrodes to detect the presence or absence of artrial fibrillation. You will be asked to roll up your sleeves and roll down your socks. You will lie on an exam table while a technologist applies electrodes above your wrists and ankles. Peripheral arterial disease (PAD) is more commonly known as hardening of the arteries. Peripheral arterial disease screening is done by using the ankle-brachial index (ABI) and can identify most cases of peripheral arterial disease. Anyone who has risk factors for PAD should speak to their physician about this screening. The ABI screening for PAD is simple and painless procedure. You will be asked to remove your socks and shoes, and pressure cuffs will be placed around your upper arms and ankles. Our sonographer will use a small ultrasound device to measure the systolic blood pressures in your limbs. Abdominal aortic aneurysm (AAA) is a condition in which the lining of the aorta becomes enlarged within the abdomen. Abdominal aortic aneurysms are likely to tear if they reach 5 centimeters in diameter, making screening for AAA crucial in preventing a rupture. A ruptured AAA can cause blood loss, shock, and death. Anyone at risk of AAA should speak with their physician about making this screening a vital part of their healthcare plan. 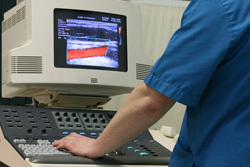 Screening for AAA is painless and done using ultrasound imaging. Our sonographer will instruct you to lie on your back on an exam table and apply gel to your abdomen. They will then takes images and measurements of your aorta by moving an instrument called a transducer across your abdomen. When you arrive for your AAA screening, there are several ways in which you must prepare for the exam. Wear a comfortable, loose fitting 2-piece outfit. Fast for 4 hours prior to your screening. Make sure the meal you eat 4 hours prior to your screening is a light one (less than 1/2 of what you normally eat of non-gassy food). If you are thirsty during your fasting period, you may have up to a 1/2 cup of coffee or tea and a moderate amount of water.